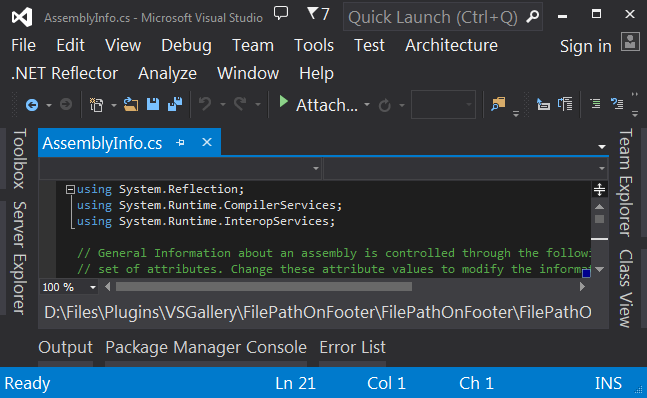 This lightweight extension lets you display the full path of the file at bottom of Visual Studio's Editor. Click Ctrl+Clcik to Open Containing Folder, Right click to Copy Full Path. Note: please show your support by giving a quick review. It only takes a few seconds. Read more from official page of File Path On Footer plugin. This lightweight extension lets you display the full path of the file at bottom of Visual Studio's Editor. Click Ctrl+Click to Open Containing Folder, Right click to Copy Full Path. This will be very helpful if you are working on files which is having similiar and or same name. Visual Studio IDE already shows the file path when you hover the mouse over the document tab but I like to see the file name always on bottom of editor. File name always on bottom of editor. Open Containing Folder using Ctrl+Click. Copy Full Path using Right Click. Copy Partial Path using text selection. Use Alt + Click to force Theme updation. 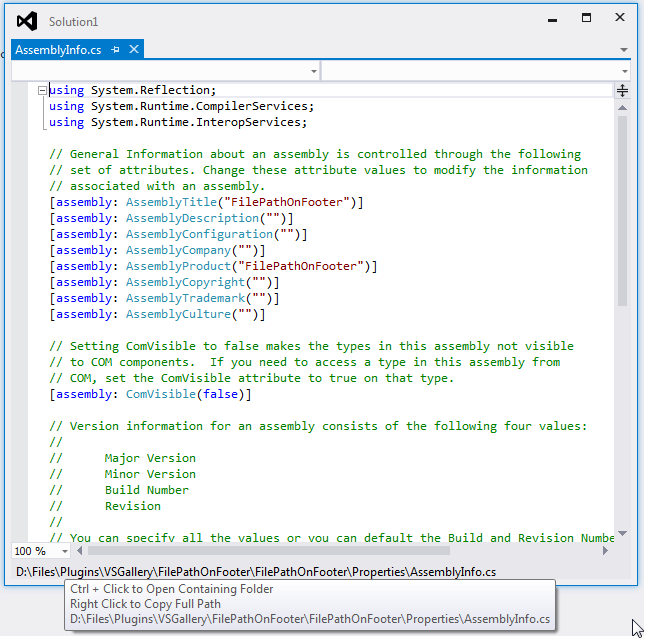 Standard Visual Studio themes are supported. Environment Font settings are also supported. Fixed - For some initial installation plugin didn't detect default theme, which is corrected. Fixed- Visual Studio 2015 theme compatibility issue. Fixed- Visual Studio crash when doing database compare for the second time. Fixed - Visual studio crash when opening Quickwatch after upgrading to 1.4.3. Fixed - Invalid Exception message while copying file path using right click. Fixed - File path was not properly visible (bottom area was cropped) if we change the Environment Font settings. Fixed - Unwanted exception message was showing on Web Essentials Preview Pane of .LESS file. Fixed - underscore (_) was not showing in file path. Read more from Official Page of this plugin.